- 8 foundation piles (top right) - build up in suit from the rank of first card dealt to the first pile, wrapping from King to Ace as necessary, until each pile contains 13 cards. - 8 tableau piles (below foundations) - build down by alternate color. Only the top card of each pile may be moved. Spaces are filled by the reserve. When the reserve is empty, spaces may be filled by any card. At the start of the game 1 card is dealt face up to each pile. - reserve (left of tableau) - top card is available for play on the foundations or tableau. At the start of the game 21 cards are dealt here. - 9 tableau piles (below foundations) - build down by alternate color. Only the top card of each pile may be moved. Spaces may be filled by a card from the waste only. At the start of the game 1 card is dealt face up to the first 4 piles. One of these cards is selected to be the foundation base card by moving it to the first foundation pile. After a card is so moved 1 card is dealt face up to the remaining empty piles. 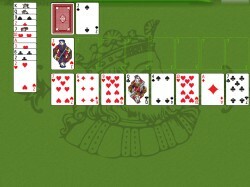 - stock (top left, face down) - turn over cards 1 at a time to the waste by clicking. No redeals, except that when the stock is empty the waste may be turned over by clicking. Cards may then be played to the foundations or tableau until an unplayable card is reached (which ends the game).